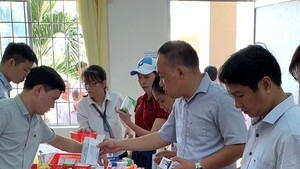 Ho Chi Minh City authorities decided to continue activities to improve people’s awareness and exercise with the aim to improve city dwellers’ nutritional status and height, reduce non-communicable diseases and micronutrient deficiencies. The municipal Nutrition Center under the Department of Health yesterday convened a conference on solutions of health matters because dwellers in big cities are facing big challenges on nutrition and health matters such as obesity, overweight, and non-communicable disease, micronutrient deficiencies and malnutrition amongst patients. According to Dr. Phan Thanh Tam from the center, medical workers are successful in increasing people’s knowledge about nutrition and physical exercises with the aim to improve their height and health as well as curb the increase in overweight condition, obesity, non-contagious chronic disease, micro-nutrient deficiencies and malnutrition, as per the national nutritional strategy's goal. However, Dr. Tam said due to changes in the characteristics of disease, medical workers have not met the people’s demand; accordingly, above-mentioned matters still maintained. Hence, the city’s Nutrition Center will continue its activities to raise people’s awareness. Specifically, the center aims at reduce the rate of underweight, malnutrition and obesity children under five lower than 5 percent, 7 percent and 12 percent respectively. Moreover, the rate of children aged 6 to 36 months and women after childbirth taking high-dose vitamin A will be over 98 percent and 90 percent respectively.